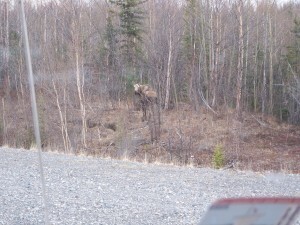 6 moose. That’s #6 pictured. “I’m not a number! I’m a free moose!” Sorry, couldn’t resist. A quajillion BFRs (snowshoe hares). Those things are everywhere, mostly racing across the road, often in pairs that split, quantum entanglement-like, off from each other at crazed angles. That’s about it. 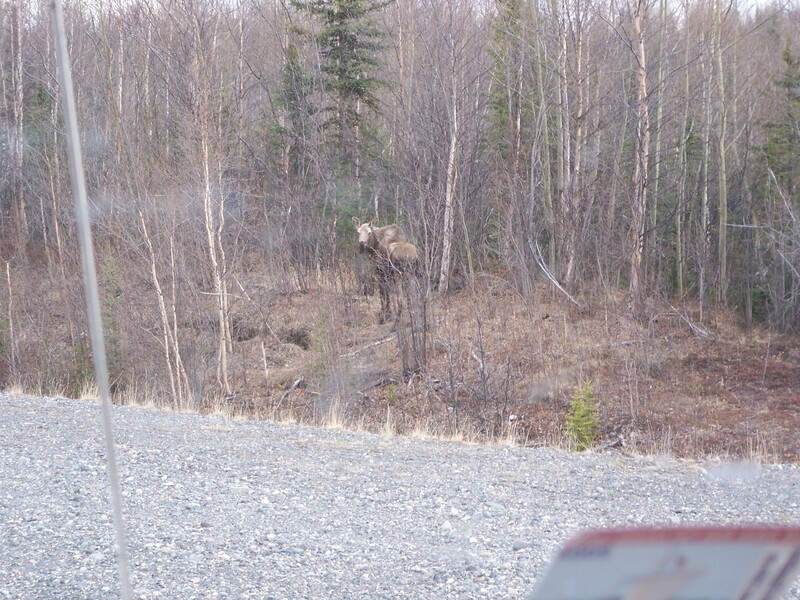 Critter count really tanked in Alaska. No grizzlies, thankfully. We just finished driving the Top Of The World Highway. “Mostly paved.” I’d say about 1/4 paved. 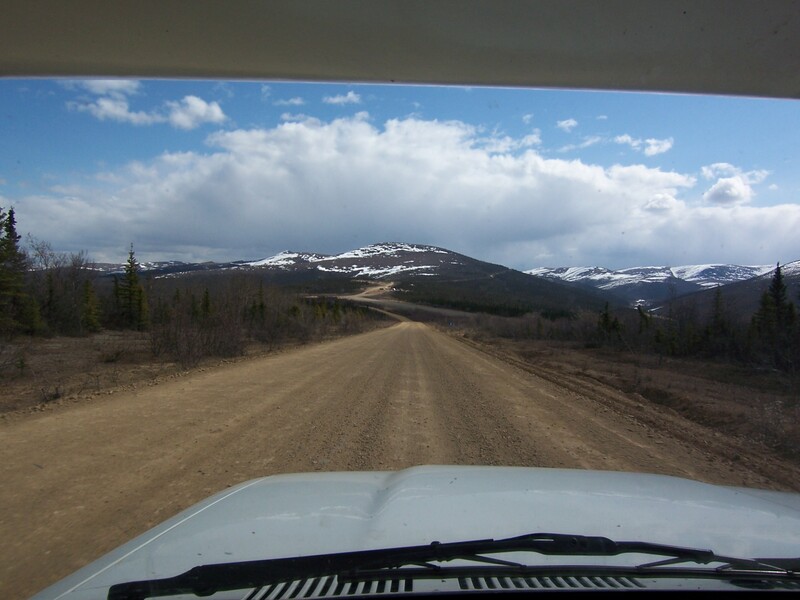 On the US side, paved from the turnoff near Tok until a few miles before Chicken, then dirt the rest of the way to the border. 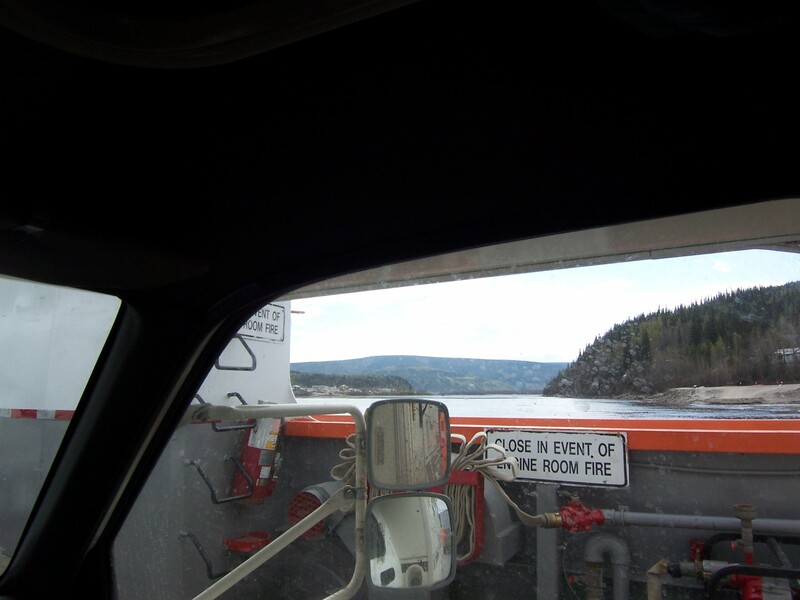 On the Canadian side, alternating gravel and short sections of blacktop until the ferry into Dawson. Not motorhome friendly, but we went very slowly and made it across OK. The views are amazing. 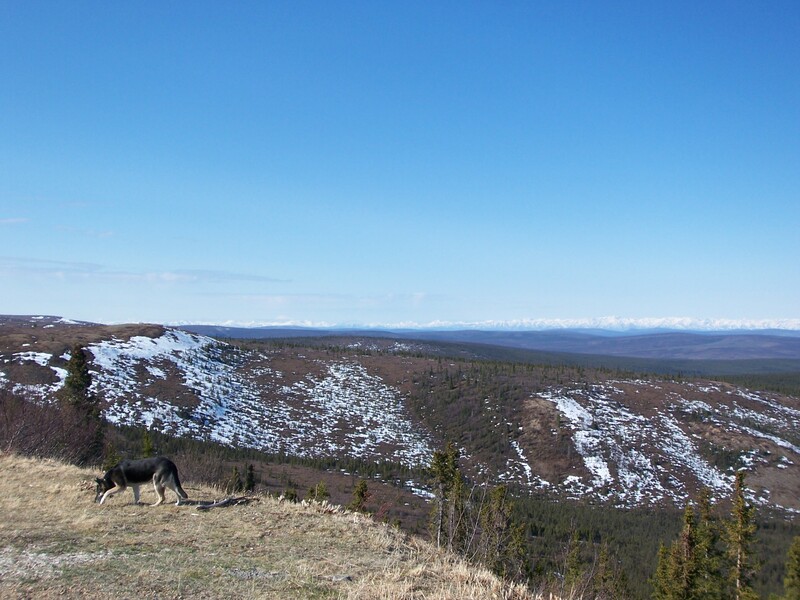 And you could almost see the top of Denali–just a few clouds today! If it wasn’t for the dirt and gravel, I’d call that road a moto Mecca. Lots of swoops and twists and fun bits. But the slogs are too long for the road to be worth the pain. 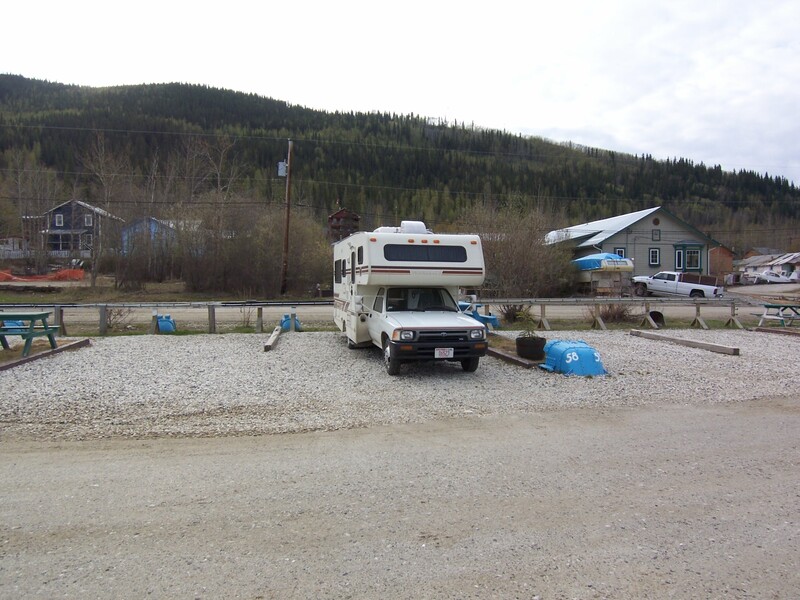 Before that, we camped (RV style) at Tok River SRA. Small but sweet, right on the river. 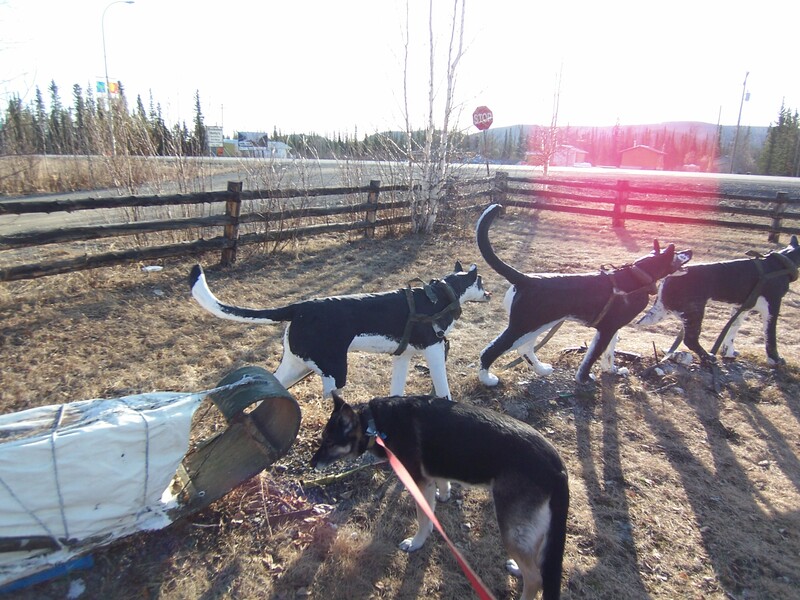 The famed dogsled trail runs right through the campground (no dogs in our party were interested in mushing it). Dawson is a very cool town. I hesitate to call it a city. In a lot of ways, it is kind of what I hoped Fairbanks would be. Tiny, tough, and with nothing but dirt streets and wooden sidewalks. Yeah, it’s a tourist trap, but a well-done one. Either that, or they just haven’t bothered to modernize in a century or so. That might actually be close to the truth; the touristy glitz feels recent and thrown-on. Fittingly, the gold panner’s convention is in town tonight. 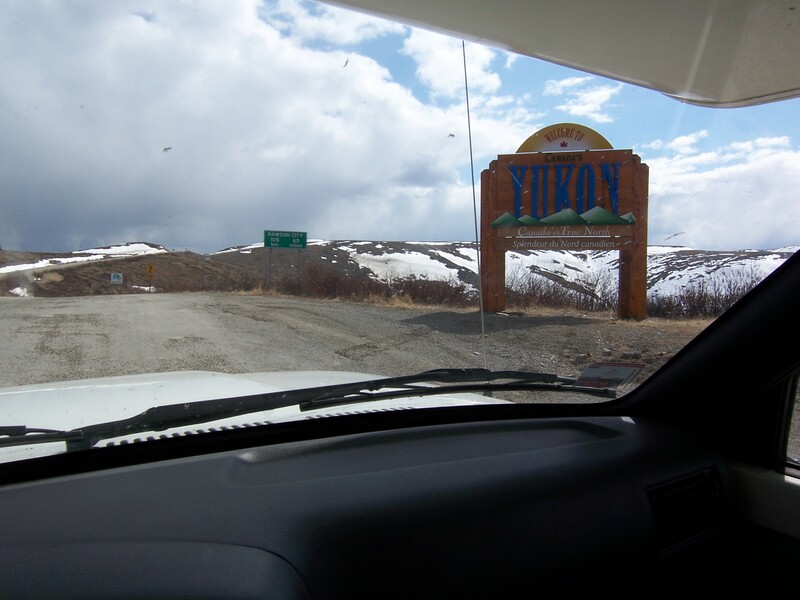 I’m starting to understand the call of the Yukon. There’s something here that’s missing in Alaska. I don’t know what it is yet, but I can feel the difference, very strongly. I might have to come back here someday. It’s getting late, but here are few rants and thoughts about the Frontier State that have been banging around in my noggin. We’re done with Alaska, and will be spending more time in YT/BC rather than muddling around with the newly-arrived tourist throngs over the border. Deja vu all over again. 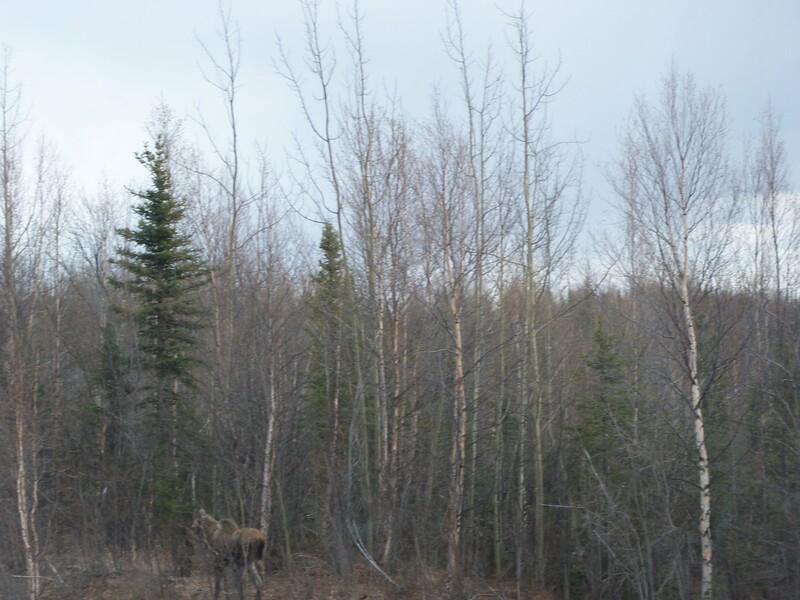 Honest to Pete, Alaska looks one heck of a lot like northern Wisconsin. It really really does. I kept feeling like “I’ve been here before…” and “I drove 3500 miles just to go to Hayward?! ?” Big differences: Huge mountains looming to the west; moose; grizzlies; only one green and gold house (that I noticed). Other than that, it’s Up Nort, only stretched out. Wisconsinites heading up shouldn’t expect to see much that they haven’t already seen at home. OK, there’s a whole other Alaska, the part that isn’t on the highway system, and is north and west and is only serviced by planes and ships. That part may be quite different. And may be the “real” Alaska. I hope so. 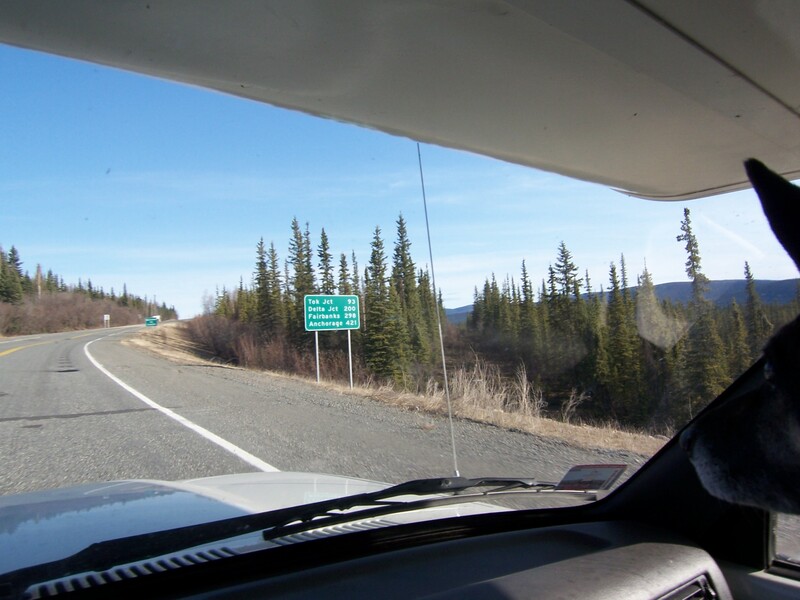 Alaska’s highways form a big loop (or ring road or really huge traffic circle). The loop goes straight through some places (Fairbanks, Denali State and National Parks), and has spurs leading to other places (Anchorage, Valdez, Tok/Canada). 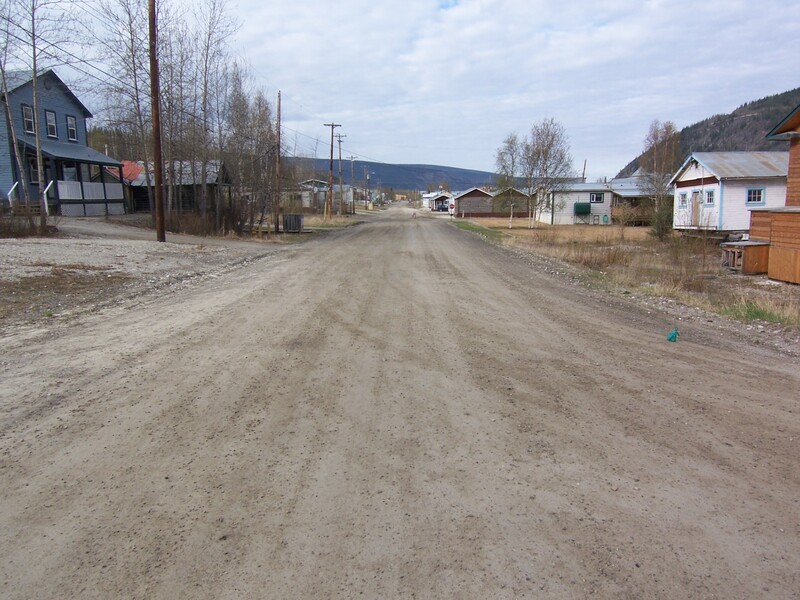 Contrary to popular belief, Alaska has real roads. The major highways are all paved, two or four lane, and generally in pretty good shape. 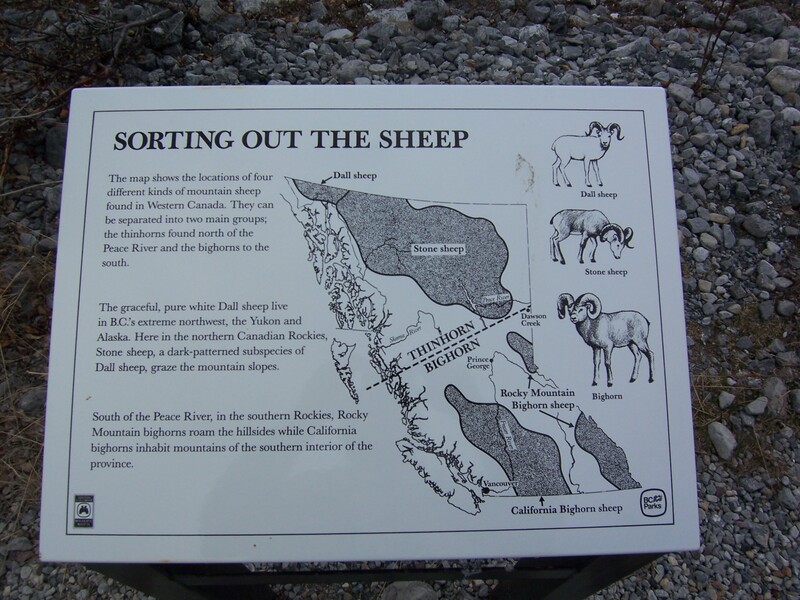 The only exceptions are Top Of The World, and the spur leading to Tok and Canada (which is paved but needs some work). Important Safety Tip: (This applies more to the Yukon than Alaska.) There are these little orange flags on sticks by the side of the road. They indicate spots with severe road damage, and should be taken quite seriously, like slowing to 30 MPH or less RIGHT NOW. There are many many many spots on the Alaska Highway between Whitehorse and the border that have these flags. There are at least as many that should but don’t. Fairbanks is a small city that is on a growth spurt. I get the impression that the people there want to think of it as some sort of northern town, but it’s more Stevens Point than Dawson. Well, the Barnes & Noble and WalMart both have “western town” facades. UA-Fairbanks is quite pretty. It is nestled in the forest above town, much like UC Santa Cruz. It is a very compact and cozy campus. It has a strong physical sciences slant, and has the general vibe of a technical college. 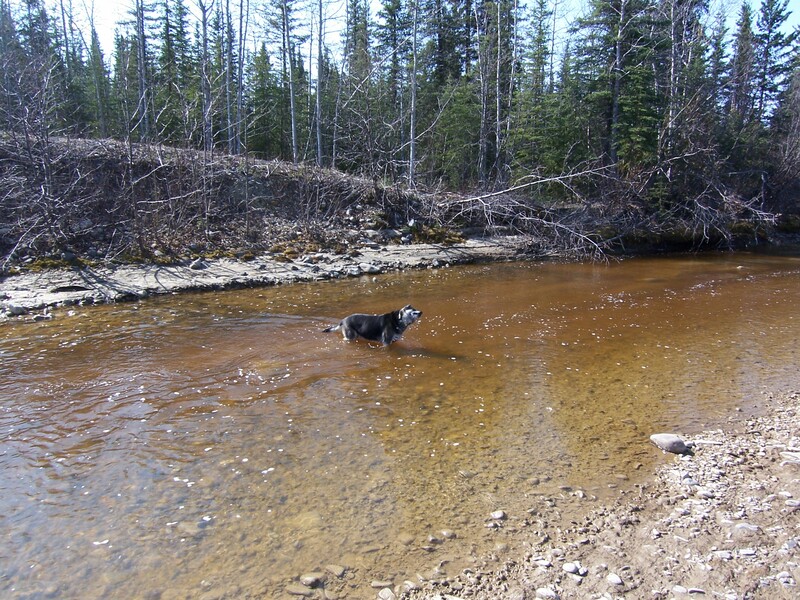 The Chena River parks system is by far Fairbanks’ best feature, and is pretty neat. Other than that, there’s not much spark. That’s all for now. Tomorrow, we head for Mayo, then points south! Or get lazy and stay in Dawson for another day. No cremations yet, though? It would probably be best to keep it that way!